I’ve been covering these gruesome discoveries since Feb, 2008, (at one point I even started a new category for it), and its happened again. Eleven feet in sports shoes have been washed up on the west coast of North America in four years … is there a link? Theories as to the cause of the mystery have ranged from dismemberments by serial killers or gangsters to casualties from plane or boating accidents. Some have suggested the feet were from victims of the 2004 Asian tsunami, missing fishermen or people who drowned or committed suicide. “We’re certainly at a loss as to the cause of this,” British Columbia coroner Stephen Fonseca told The Canadian Press about the latest foot, which washed up in Vancouver on Tuesday. “There was no obvious trauma to the remains. “We cannot completely exclude a murder; we don’t know why they died, but we have no evidence they were murdered,” he told Agence France-Presse. 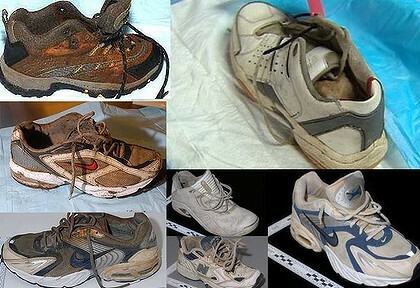 The only obvious connection between the feet – five of which have been identified by police as belonging to missing people – was that they were found in running shoes. Oceanographers also told the Toronto Star the bodies were likely to have all come from people living on the west coast of North America. In 2008, after the fifth foot was found, US oceanographer Curtis Ebbesmeyer said the mystery was “something suitable for Sherlock Holmes”. “Finding five feet in one localised area would be highly unusual anywhere in the world,” he told Bloomberg. the discovery of this number of feet in four years was not coincidental. People are wondering why this is only happening on the West Coast, and why aren’t other body parts of these people being found? A Wikipedia page with a timeline of the discoveries, here. The couple who found the left foot shoe in a tidal flat area along the Fraser River on Tuesday told local media it contained a sock and what appeared to be human remains, which have now been turned over a coroner for DNA testing. Five disembodied human feet have mysteriously floated ashore in the Canada’s Georgia Strait since August 2007, and sixth foot was found three months ago in adjacent U.S. waters near Port Angeles, Washington. There has also been at least one shoe found that later turned out to be a hoax. “Obviously due to the fact that a hoax was perpetrated previously and then extensively reported on we want to proceed cautiously until we know exactly what we are dealing with,” said Constable Annie Linteau of the Royal Canadian Mounted Police. Canadian and U.S. police have not been able to determine who any of the feet belonged to, but say there is no evidence they were victims of foul play. Two of the feet found in Canada belonged to the same unidentified person. The left shoe found on Tuesday was made by New Balance, the same brand that contained a right foot that was found in the same area of Richmond, British Columbia in May, police said. I threw this theory out as an afterthought on my previous post about Vince Weiguang Li, the man who stabbed to death, and then decapitated 22-year-old Tim McClean on a greyhound bus. The thought occurred to me that the two cases might be connected. According to police there were 2,371 people listed as missing in the (BC) province at the end of May, with gang-related crime, drugs and homelessness all contributing to the problem. The exploits of Vancouver area pig farmer and convicted murderer Robert Pickton loom large. Pickton was convicted last year of the murder of six women, and according to the prosecution at his trial confessed to the murder of 43 others. The suggestion that there may be a criminal element connected with the appearance of so many feet is bolstered by the conclusion of Ebbesmeyer and other oceanographers that the feet have most probably been born down the Fraser River – which flows from the Rocky Mountains before reaching the Pacific Ocean at Vancouver – swelled by the spring snowmelt. “This is such a highly improbable situation it begs the question of foul play,” said Ebbesmeyer. The police are refusing to speculate. Li was armed with a knife, and a pair of scissors. He was cutting off body parts…It may well be that young Tim McClean was not his first victim. Sorry for such a morbid post. Posted in Floating Feet, Sad but true, Scary Stuff. A shoe containing bones and flesh has been discovered on a remote Strait of Juan de Fuca beach about 40 miles west of Port Angeles, 14 miles from the Canadian shoreline. The grisly discovery comes nearly a year after the first of five sneakers containing human feet were found washed ashore in British Columbia, triggering one of the most bizarre cases in provincial history. The latest shoe, described as a hiking boot, does not match any of those discovered earlier in Canada. But, like four of the five others already found, it is a right foot. A camper found the large black, high-top shoe in seaweed while walking along the shore near the mouth of Jim Creek on Friday and relayed the discovery to the Clallam County Sheriff’s Department at about 2:30 p.m. Saturday. Previous posts here (scroll down). Could the severed feet be related to the Canada Bus Slayer? One of the five feet that have mysteriously washed up on the shores of British Columbia over the past year has been linked to a depressed man who went missing a year ago, police said Saturday. Police sergeant Pierre Lemaitre said DNA testing helped to identify the man. The man’s name is not being made public at the family’s request, said Lemaitre. A team of investigators has been working on the bizarre case since the first foot washed up last August on Jedidiah Island in the Strait of Georgia. Since last year, detached feet began appearing, floating within a few miles of each other along island shorelines in the Strait of Georgia near Vancouver. The bizarre findings baffled Canadian officials. It had been theorized that the floating feet were remnants of decomposed bodies of people who were in boating accidents. Other theories are that they were from victims of the 2004 tsunami, victims of a serial killer who dumps his prey at sea, or cadaver parts that “bored or mischievous people” tampered with. It looks like this one was either suicide, or serial killer.